This 5.56x45 cartridge is made to military specifications by Prvi Partizan, the Czech ammunition manufacturer whose products’ quality has earned them business from shooting enthusiasts, hunters, law enforcement professionals, and militaries throughout the world. The M193 round features a 55 grain projectile with a full metal jacket, ideal for extended target shooting because it will prevent the buildup of lead residue which would make your accuracy go south fast. 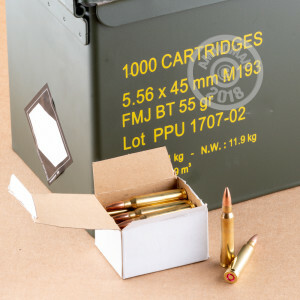 Appealingly, these 1,000 cartridges come neatly packaged in a steel ammo can. The can closes tight and is waterproof to protect its contents from moisture and other debris that would harm it, making it the ideal solution for future camping and hunting trips as well as worry-free stockpiling. 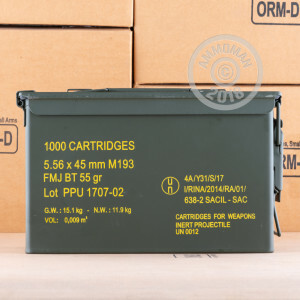 Best of all, we’ll send this beefy can of ammo right to your door free of charge -- tack on some other purchases to this order and enjoy free shipping on it as well!